First take one kadai, add 3 tbsp of ghee. When the ghee become hot, add rawa and roast till nice aroma comes and its change in to golden in colour. Then keep aside. Now take one heavy bottom vessel. Keep on the gas and add jaggery to that along with milk and little water. [ just jaggery should dip ] allow to boil in low flame. When the jaggey gets one string add the roasted rawa in to that. 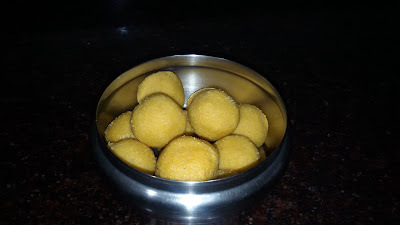 Mix well add cardamom powder and fried cashews.If required add some more ghee and mix well when the mixture become thick remove from the fire and shape into small balls.